Who says nice guys finish last? 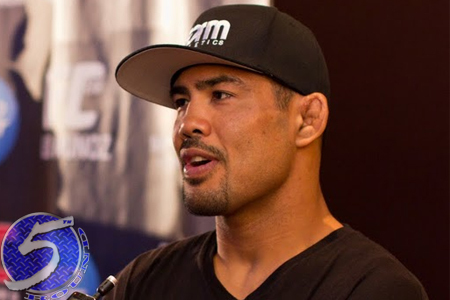 Despite losing three of his past four scraps, including two straight first round finishes, the UFC has inked middleweight Mark Munoz (pictured) to a four-fight contract extension. Munoz announced his signing Thursday via Twitter. Some thought the 36-year-old’s future with the planet’s premier mixed martial arts promotion was in jeopardy after he was submitted by Gegard Mousasi last month in Germany. The UFC subsequently removed him from the list of eligible athletes media members could vote on for their Fighter Rankings, but later explained that it was because Munoz was no longer under contract. Munoz is currently recovering from a left knee injury he suffered in the opening ticks against Mousasi. MMA’s Mr. Nice Guy told 5thRound.com today that he will not require surgery on the grade-three tear in his MCL and strained ACL. “The Filipino Wrecking Machine” said he’ll be riding the pine for 8-10 weeks. Munoz transitioned to the UFC after the WEC folded in 2010. He owns a 13-5 professional record, going 8-5 in the big leagues.